This cruise is a desperate attempt to escape the never-ending stress of our Bonsall remodel, now going beyond two years! Since we aren't foolish enough (anymore!) to leave it unattended for more than a week or so, we're limited to short, local cruises for the foreseeable future. Literally days before we returned to Laguna Niguel to pack, they were pouring concrete walkways, setting stone patios, and finally installing steel for the spa. We've only been trying to get someone to commit to doing the spa project for a few years now! Let's just say, it didn't go well at first and we're still not sure what will transpire over the next few months, but at least something is happening. We ditched the disastrous landscape contractor years ago and have been doing the work ourselves or hiring out individual projects to a fairly reliable sub-contractor. No more landscape contractors for us! So far, so good. Although it is slow going, we are happy with the areas we have finished and there is no doubt we will end up with a more creative result. There may be light at the end of the tunnel after all. Although we are far beyond the 30th Milestone reward level with Crystal, we are behind in cashing in the rewards. We're not 100% certain, but we think this is our 36th Crystal cruise. Our decision to use our 30th Milestone for this cruise saves $2,900 per person off the fare, which makes it roughly half the going rate, already a discounted sailing. We will also receive a complimentary limousine transfer from our home to the ship and back, numerous credits on our shipboard account, pre-paid gratuities, etc. There are additional perks, but we never use them. These include a free shore excursion and a cocktail party for ten guests. On a few occasions in the past we have received credit for the unused events, but we never count on it since it seems to depend upon the whim of the person in charge at the time. Don't expect a whole lot of excitement from this cruise. We have no intention of leaving the ship to visit ports and there probably won't be much new to report about the ship or the cruise itself. But, you never know! Our limo driver arrived promptly at 1:00 PM, compliments of Crystal Cruises. The drive to the port took exactly one hour with no traffic to speak of. Upon arrival we were surprised to see absolutely no activity. All of the porters were sitting around waiting for customers. We were greeted by a Crystal representative and escorted to the security check point. There were maybe ten other guests milling around, if that, so check-in was speedy with no lines at all. The woman who checked us in said it had been this way all day. We were on board in less than fifteen minutes. We were surprised to find Phil & Rita, formerly of AAA, at the gangway. They had been showing a friend around the ship and just happened into our open stateroom where they saw our names on the paperwork. Small world, huh? They left us a card and note on the desk. 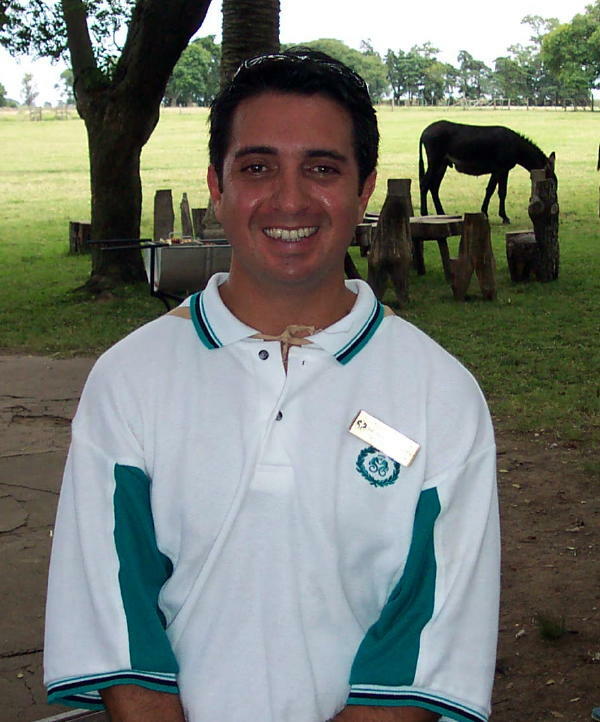 Our very friendly butler, Cetin, arrived within seconds to introduce himself and offer his services. Our luggage arrived shortly thereafter. 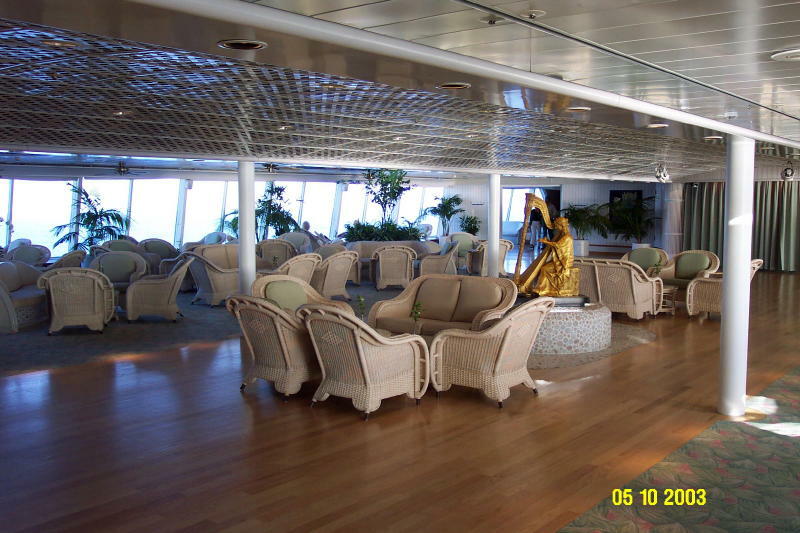 There have been a couple of changes since our last cruise regarding penthouse amenities. Guests now have a set menu from which to select the next afternoon's canapés. While this is a good way to avoid the waste associated with serving unwanted (and too fancy) snacks, we don't think this is a "six-star" procedure that instills an aura luxury. The choices were the same as always: Caviar, Jumbo Prawns, Cocktail Claws (we assume this means crab or lobster), Vegetable Crudités with Blue Cheese Dip (which has always tasted like feet), Guacamole with Chips (we started this years ago by requesting it during a World Cruise), Smoked Salmon on French Bread, Prosciutto with Melon Balls, a Selection of International Cheeses, or an Assortment of Fruit and Berries. Another change is the elimination of the stock of small liquor bottles in the refrigerator. Penthouse guests used to receive a full supply of free liquor. While technically this was always limited, one was able to get pretty much anything restocked at no charge. We are now limited to one full-sized bottle each of any liquor we choose from a set menu. For us this isn't an issue, but it is another cost-saving policy that detracts somewhat from the ultra-luxury aspect. There is an endless supply of wine and champagne offered from the same menu. Soft drinks and bottled water are free to everyone, both in the room and elsewhere onboard. We asked Cetin to make reservations for tonight in Prego and for two formal nights, one the French menu and the other Baked Alaska night, in Kyoto. 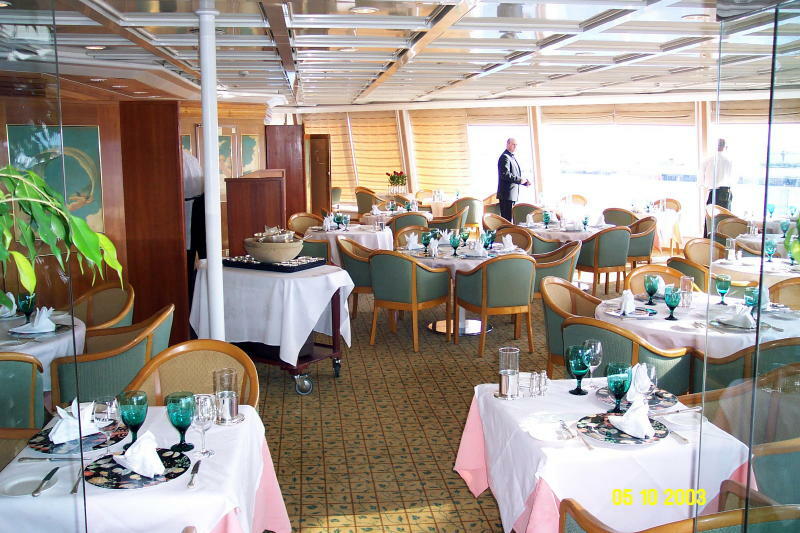 Guests are supposed to be limited to one reservation until later in the cruise, but we know that almost no one goes to the alternative restaurants on formal nights. Our stewardess, Eriika, arrived within a few minutes to verify our special requests for bedding, pillows, etc. We don't actually request these things in advance per se. They keep a record of what we asked for in the past and it hands down from cruise to cruise, a good idea. It appears that this is done by the butlers, so it may not be something that trickles down to the lower category staterooms. However, we would be willing to bet that sailing on a World Cruise has something to do with it. As far as the Penthouse itself, there are wooden wedges shoved into the ceiling panels near the walls to prevent creaking, but they seem to do nothing. This doesn't bother us, but it must have bothered someone else enough to make them install the shims. The wind comes right through and around the glass sliding door, not to mention the cigarette smoke from next balcony. Similar odors waft from the air conditioning from time to time, also. The lamps are new since last time and add a bit of color to the otherwise very dated avocado green furniture. Unfortunately, the lamp next to the sofa is too low and the shade intrudes on the arm. The fabrics, drapes and carpet are like new. Upkeep is very good, but ship shows its age, mostly in wear outside. There was a "special dinner" invitation from Crystal Society Host Andrew. Apparently, we are in the top three number of cruises during second seating. We know there is at least one guest on board with 110 cruises, so our 36 pales in comparison. The letter also said to contact the concierge to arrange a complimentary transfer home, so we went down and talked to her. She was extremely nice and asked what kind of car we prefer: limo, van or town car. We took a short walk around the ship just to get oriented again. Paulo in the Bistro not only recognized us, but knew our names and who is who, an amazing feat. Even when we don't see him for a few years he remembers us right away and knows exactly what we like. In this case, we were just stopping to greet him. We noticed that the Crystal Fountain is dry and looking quite tired. It is in dire need of a good polishing, as it was last year, as shown in the photo link. The mandatory boat drill was held at 4:15, after which we took the laptop to be configured for internet access in our room. The extraordinarily helpful "Dean" didn't charge us the $15 set-up fee because our computer already had info on it from Crystal Serenity. That's the reason she gave to justify it anyway. We really think it was because we joked around with her. By the way, this is $10 less than they charged last year. Even so, it is outrageous for something that takes all of 2 minutes. We signed up for the $300 "unlimited" internet flat rate for the cruise. That's unlimited "up to three hours per day." Is it unlimited or isn't it? Apparently not. The top speed available is around 32bps, which in the cabin ranges around the 19-22 range, which is ridiculous for the price. On the upper deck for the sail away we ran into Andrew and chatted briefly. Andrew told us he has gift from Mark Merchant that is "so valuable" he has to give it to us in person. Waiters were handing out complimentary margaritas on all of the outside decks and the band was playing by the pool. Later we were greeted warmly by Benji who has become more comfortable here after her sudden transfer from the Symphony when her husband, Marco, was promoted to Shore Excursion Manager. 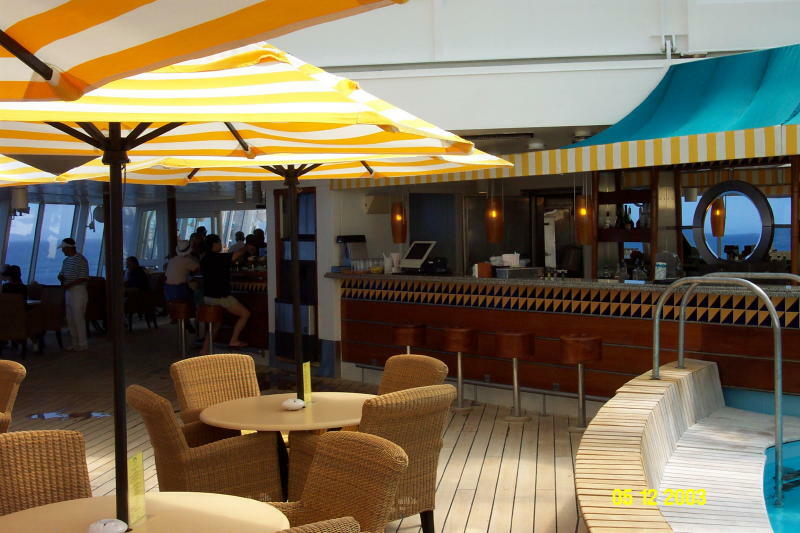 Ron Goodman, the cruise director, was pleasant to us and said the appropriate things. On the way back to the room we greeted Thomas Masloum in the hallway. He is one of the executives from the main office who hosted our table at the World Cruise Bon Voyage Party in 2003. He is on board for 2 days with lots of other staff from office for meetings. Later, Cetin told us that he had been instructed to "take good care of us" by Thomas. That may mean pushing us overboard, of course. We went down to stroll the public decks and saw Marco waving from his desk in the lobby. On the way down we were sidetracked talking with Andrew. We declined his his dinner invitation because we don't want to go to Prego more than once nor are we interested in the group dinner thing with the set menu. He said he will see us at Prego tonight and deliver Mark's gift then. Josef, the Hotel Director, came over to greet us and say suitable things. We learned that there are roughly 200 Crystal Society members on this cruise with a little over 600 total guests on board. No crowds this time around. The ship holds about 940 at full capacity, but 600 seems to be about average these days. We received our confirmation cards for dinner tonight in Prego, plus the two for Kyoto later. However, a mistake was made and one of these was for Prego, so we plan to rectify it tonight when we go there for dinner. Tonight's dress code is Casual. The first night is always open seating with no assigned tables in the Crystal Dining Room. This is a policy we have never understood, especially when the ship isn't anywhere near capacity. In our opinion, this isn't the best way to start a luxury experience, but it has been this way since day one. So, the best bet is to try to get a reservation in one of the alternative restaurants for the first night, which we did. Our dinner tonight is in Prego, as mentioned previously. The Maitre d', Enzo, was extraordinarily accommodating and changed the errant Prego reservation for Kyoto right away. The decor of Prego on the Harmony isn't anything to speak of, but the room is cozy and pleasant. The service was very friendly and helpful, as expected. As always, the highlighted items are what we actually ordered. The menu is basically the same except all of the Valentino items had changed, for the better. Both of us had the halibut entree. Everything was satisfactory, but only the entree and the flourless chocolate cake in the dessert sampler were excellent. Everything else was average to above average. Andrew sent over Mark's gift, a signed DVD of his act, and bottle of red wine. We will have a detailed critique of Mark's act posted later (just kidding Mark). Tonight's entertainment is the Welcome Aboard Show, "Pirates to Pinafore". The evening was arranged a bit more coherently than usual with a brief introduction of the upcoming activities by the Cruise Director. Rather than dragging every staff member up one by one, he announced in general what would be available, then showed a video orientation of the ship. There were two numbers by an acceptable dance instructor couple. They were talented, but not as much so as a few others we have seen previously. The Crystal Ensemble performers were fine, but this show is quite pretentious and boring. Several people left before the end, as usual. Ron did a good job handling his tasks efficiently with little wasted time. We think they should put up a more dynamic opening show to generate interest for what is upcoming. We move one hour forward on the clock tonight. It was smooth sailing all night and into the morning. It isn't as rough as it might appear on the Crystal webcam. Today's weather is slightly overcast with choppy seas. The movement of the ship is barely noticeable, however. The temperature is in the low 70's in the shade. Although we were awake early enough to make it to breakfast, we didn't bother getting our act together until noon. No need to give the stewardess hope we'd continue to be out early, after all. We went to the lobby to check the lunch menu in the Dining Room and decided to go to the Lido instead. The Lido was busy, but not crowded. If the guests could figure out what the heck the system was up there it might move along faster, but such is life. 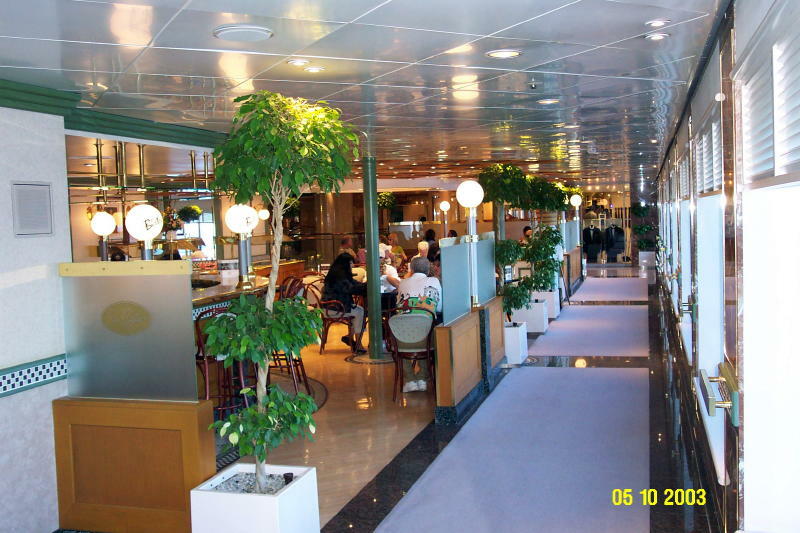 We've mentioned on previous trips that the layout makes for several bottlenecks, but the basic food offering is the same as the other two ships. 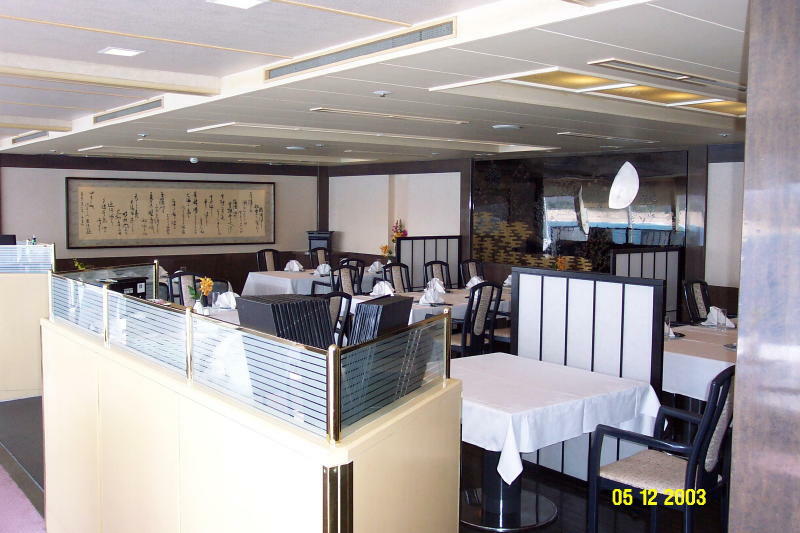 We selected a couple of entrees that were fairly tasty and found a table on the aft deck. Waiters refilled our iced tea several times during the meal. After lunch we moved out by the Seahorse Pool to listen to the band for a while. There were a lot of people out by the pool even though the sun wasn't shining. It wasn't crowded by any means, so there were plenty of tables and lounges available. We sat at a table in the shade, as usual. While the service poolside is friendly enough, it isn't nearly as attentive as in the past. It was at least 30 minutes before we were asked if we wanted a drink. We're sure if we made the appropriate gestures that someone would have rushed over, but we've never had to make any effort at all before. When the band finished we went back to the room, where we stayed until dinner time. We missed our canapé delivery because our "Do Not Disturb" sign was on the door for a few minutes too long. Cetin did leave a message to page him, but when we did he didn't answer. We could have called the Front Desk to page him again, but we didn't care enough to do that. Bill went to get cookies instead, which took about 2 seconds. In the meantime, Cetin arrived with our snacks, then went to retrieve tonight's dinner menu and the menus for Prego and Kyoto. Bill had sent a note to the Broadcast Manager asking whether he could transfer a PAL video we bought in Europe to NTSC format. He called back promptly to say that he would be happy to do anything we want, which was very accommodating. By the way, the noise from people moving lounges and walking on the pool deck above us is fairly disturbing at times. It's odd that ships put the most expensive accommodations in such locations, but that seems to be the norm. Tonight's dress code is Formal for the Captain's Welcome Aboard Party in the Palm Court before dinner. We fully expected to use the back door to bypass the receiving line, but we found that no line existed. In fact, when we walked up, the Captain had to scramble back to the door to greet us. Andrew was stationed outside the door, so we were talking to him for a few seconds before the Captain returned to his post. Andrew wanted the report on Mark's DVD, but we haven't had time to view it yet. We greeted the Captain and started to walk on until he asked if we wanted a photo with him. It was odd that it was up to him to keep things moving once inside the door, but at least he did think to ask. Josef, the Hotel Director, was also there, but no other officers. Only one other couple came in behind us and this was exactly at the appointed arrival time. There were enough guests in attendance that it didn't look pathetic, but it was rather sparse. We went directly through to the Vista Lounge and sat in a quiet corner. A cocktail waiter had followed us and brought us drinks right away. Ron stopped to ask if we had been contacted by the Broadcast Manager and we informed him we had and that we were happy with the response. The Captain's speech was so short that the party was over twenty minutes earlier than usual. We sat around until 8:30 PM, then wandered toward the dining room via a detour across the pool deck. Another multi-cruiser had done the same thing and we rode down to the dining room with her and another couple. At the Crystal Dining Room we were asked our table number and ushered to our table for two around the outside of the center divider, which we prefer over a window seat. Walter, the maitre d', must have made a note from our last visit because the routine would normally be to seat us by the window as most guests prefer. Our waitress is Zsuzsa, our assistant waiter is Tadas, both from Hungary and neither of whom is familiar to us. That can't be said for our Headwaiter, Didi, whom we have known forever. We thought he was gone, which it turns out he was for a while. He was thrilled to catch up on some of the gossip from the other ships and the World Cruise. He told Walter that we know more about the crew than they do, which may be true in certain respects. There is a section of the menu labeled "Low-Carb", but it is a nothing more than a list of items from the regular menu that the chef considers to be lower in carbohydrates. For example, tonight's low-carb entree was the Beef Tenderloin Salad. Food review: The fruit appetizer was attractively arranged and very tasty. The soup and salad courses were satisfactory, but nothing special. We enjoyed the pasta course, but it had been sitting around too long and was stuck together. The sherbet came out so melted that it would have made more sense to drink it. Our waitress really should have replaced it and not brought out something that had been sitting out that long. It had a nice flavor though. The Chateaubriand was very good, as were the whipped potatoes served with it, which is a first. Dessert was edible, but that's about all we can say for it. We spent a lot of time chatting with Didi who seemed genuinely interested to catch up on things. We learned a few tidbits during various conversations tonight. As we expected, the ships are not sailing with anywhere near full capacity, especially the Symphony in Europe and the Harmony in Asia. Apparently it is the Symphony that is hurting the most at the moment. There have been so many complaints from World Cruisers about the Serenity that they are planning to return the Symphony to World Cruise duty. It wouldn't make any difference to us, but we do think that is a wise idea. 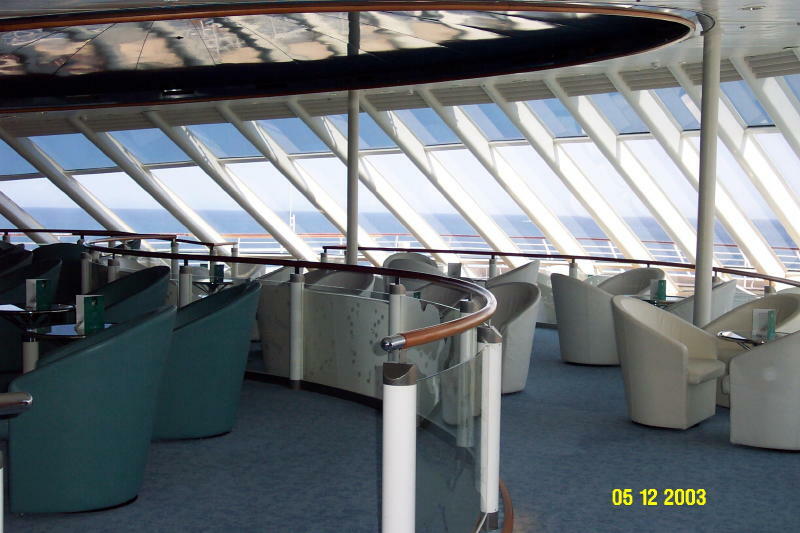 The Serenity is just too big for such a small amount of passengers and it makes for a very quiet ambience that isn't conducive to the camaraderie most people expect from a World Cruise. There also seem to be some features of the Symphony's design behind the scenes that make it more suitable for longer cruises, as well. The evening entertainment is the lavish production show, "Million Dollar Musicals". We spent so much time talking to Didi that we didn't have a lot of time to spare to make it to the show. Even so, we stopped briefly to talk to our headwaiter from the last Harmony cruise who had acknowledged Bill earlier upon recognizing him. Although this production show is one of the best, we found it rather tedious tonight. We couldn't quite put our finger on what the problem was, but it might have something to do with a somewhat weaker cast than usual. They weren't bad, just not great. There weren't any technical glitches that drew our attention, a pleasant improvement. That said, the boredom that set in halfway though attests to the fact that even the best show has its limits. A few guests gave the production a standing ovation, but that wasn't the majority, by far. After the show we returned directly to the room. The weather conditions are the same as last night. In other words, nothing to speak of. Today's weather is clear and warm, about 75, with smooth seas. Again, we waited until lunchtime to emerge from the room. There is a Nuevo Latino buffet for lunch around the Neptune Pool. We started off with the intention of going up there, via a detour to the lobby to drop off the tape for transferring to NTSC. Once we arrived on deck, we found them using the BBQ's with the sliding roof closed. This results in a cloud of greasy smoke filling the area, so we decided to skip it and go to the Dining Room instead. The Dining Room was nearly empty and stayed that way throughout lunch. Didi stole us from the waiter who tried to seat us at his station and directed us to a window table for two in his section. All of the selections we tried were excellent, although the Chicken Enchiladas resembled nothing one would expect. However, they had a very nice flavor, as did the Grilled Seafood Combination. The creamy tortilla soup was outstanding, but again not anything one would find in a Mexican restaurant. We chatted with Didi a few times about nothing in particular worth repeating, but it was a nice conversation. After lunch we browsed the shops and chatted with Shelley, the Shop Manager. 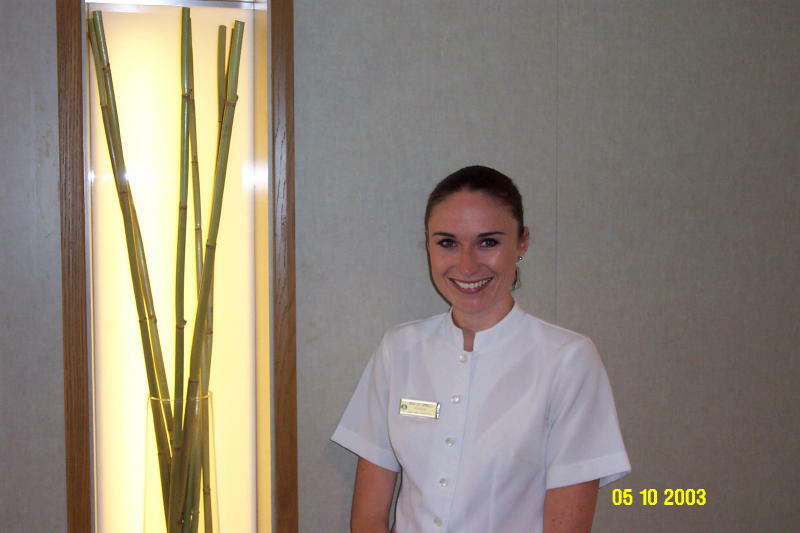 We know her from Crystal Symphony, so she filled us in on the latest from there. Again, it was nothing worth mentioning here, but we were interested in what she had to say. Since we have hundreds of dollars in shipboard credits to use up, we bought some tropical scene ceramic tiles that were $40 each, as well as a gift item for an upcoming event. Even though we looked through every shop, those three items were all we wanted, even for free. Not that the merchandise isn't beautiful. It's just that we have been looking at this exact same stuff for the last ten years. We also picked up our photo with the Captain from last night. Since Andrew wasn't busy, we stopped to chat with him for a few minutes until we were interrupted by some other guests who actually wanted something. He filled us in on the whereabouts of some of our crew acquaintances. We informed him of a few of the comments we have received from this website. One anecdote in particular prompted him to tell us we should have forwarded the message to the office to be "taken care of", but we're not serious enough about it to do that. This involved an entertainer on the Serenity who suggested we should check the entertainment list before booking to be sure we don't have to see him again. Yeah, as though Crystal can afford to have guests not book for any reason these days. Andrew was horrified that anyone would suggest we refrain from booking. We have grown thicker skin over the years, but he have been known to cancel bookings for lesser reasons that that. It was after 3:00 PM by this time, so we returned to the room to await our afternoon snacks and to watch TV. Cetin brought our pre-requested variety of tea sandwiches at 5:00 PM. We hadn't given him specific options, but everything he brought was something we would willingly eat. In other words, no caviar or smoked salmon in sight. He asked if we want caviar for tomorrow, but we told him we probably won't need anything, so don't bother. On the way out to dinner, we found Cetin holding another butler hostage in a guest's room by barring the door. He thought that was the most hysterical thing to ever happen. We continued on up to Palm Court where there was a bellman in the lobby insisting we go to the left. Apparently, there was a first-timer party going on and he assumed we belonged there. The receiving line of officers was mortified, but we simply turned around and went down to Club 2100 to kill 30 minutes. There, we found three Ambassador Hosts dancing with the three women in attendance, plus one old man watching. Dynamic nightlife, isn't it? We have no idea where everyone went tonight. They certainly weren't at the party. Tonight's dress code is Informal. We don't care about this at all, but it is worth mentioning. We saw more dress code violations tonight than we have ever seen on a Crystal ship. Nothing as radical as shorts, but there were men in t-shirts and many without the required jacket. Food review: Both soups were satisfactory, but not outstanding. The pea soup would have been rated higher, but there were dry chunks of peas in it that were undercooked. The salad was outstanding, as were both entrees. The duck had a wonderful flavor, but there were some snappy bits in it that brought it down a notch. The chocolate cheesecake was incredible with a delicious creamy texture. Didi made an attempt to come up with something he can cook for us tableside, but we aren't into the flambé desserts they always push. We told him about the caramelized fruit concoction we had Augusto make after we sampled it in Uruguay, so now he is determined to make that for us. We did like it quite a bit and had actually forgotten about it until tonight. Tonight's entertainment is a concert starring Dale Kristien, star of "Phantom of the Opera". We debated briefly about skipping the show because we have seen Dale several times in the past. However, we ultimately decided that we didn't have anything else to do, so why not? She hasn't changed anything since the last time we saw her a couple of World Cruises ago, but she was talented and entertaining. We were surprised at the amount of people who left during the show as there wasn't anything about her that warranted an early departure. Ron sat down next to us before the show to hide out for a few seconds. He asked if he could get us drinks, but we informed him it wasn't necessary for the Cruise Director to wait on us, which amused him. After the show, Ron announced that it is supposed to be 95 with scattered thunderstorms tomorrow. All the more reason to stay on board! As of tonight, there were no clouds in the sky and it has been smooth sailing since the beginning. Didi told us that it was very rough when they came through here a few months ago, so we're lucky it is so smooth now. Our shop purchases from earlier today were waiting in our room when we returned. Shelley wanted to retrieve some new ones from storage rather than sell us the floor samples, which was thoughtful of her. We move another hour forward on the clock tonight. Puerto Vallarta brims with life. Shop for leather goods, shell and silver jewelry, hand-embroidered blouses or painted figures from Oaxaca. Explore cobblestone streets and picturesque alleyways filled with the scents and bustling energy of Mexico. Today's weather is very hot and humid, in the 90's. Thunderstorms were nowhere near us, but were visible far in the distance. We are docked at a different pier than usual, directly across from the exotic shopping Mecca of Wal-Mart and Sam's Club, adjacent to the usual location. The Norwegian Star is at that dock. There is a Silversea ship anchored off shore tendering to a nearby dock. As promised, we did not go ashore today nor did we bother taking new port photos since little has changed. Our first stop was lunch. We emerged too late for the Lido or Dining Room, so we had to go to the poolside Trident Grill today. That was after dodging the gathering of stewardesses directly outside our door in the hallway. We told them it wasn't necessary to clean our room since we were so late, but they insisted on doing it. We ordered cheeseburgers and hot dogs from the grill and sat outside in the shade where it was about 95 with 100% humidity. After staying out only long enough to finish eating, we passed by the ice cream bar and returned to our verandah. There, it was a bit cooler until the clouds moved in at around 3:30 PM. Then, the humidity went even higher, if that's possible. Tonight's dress code is Casual. Casual Dining is offered tonight by the Neptune Pool, but we expect it will be too hot to be pleasant up there. Food review: The crab appetizer was presented nicely and it tasted good. Both soups were outstanding. The main courses were very good, also. The steak was a bit too fatty, but it had a very nice flavor and the onion rings served on top were especially tasty. The bread pudding was a highlight, as usual. By the way, this is the first menu where the low-carb entree was something different than the regular offerings, although we can't imagine why. It seems to us that the Mahi Mahi option would serve the same purpose, wouldn't it? The dining room was less than a third full by our estimation. It was about what would be expected on a late departure night with casual dining upstairs. We can't imagine many people wanting to sit out in the heat though. Didi entertained us with some tidbits of information and general conversation. As we had already observed, they are drastically cutting down on the tableside cooking. It's not so much that they don't want to do it, but there are new safety rules coming up that don't allow open flames. Apparently the headwaiters have to assume responsibility for anything that happens, which is ridiculous, of course. They have installed electrical outlets for new flameless trolleys, but we have yet to see them used on any of the three ships. Didi still wants to try to make the caramelized peach dessert we had in Uruguay, but we didn't want it tonight with the bread pudding on the menu. We had no where to go tonight, but Zsuzsa was antsy to go ashore. She shot glares at Didi after dinner because he was still talking long after we were finished eating. We didn't mind at all, but she certainly did. Tonight's entertainment is a single show at 10:15 PM featuring "Internationally Acclaimed Pianist" Veronica McSwiney. Earlier there was a musical mystery trivia show in Club 2100. We did not attend either event. After dinner we wandered up to the top deck to gaze at the view. We'd guess the temperature in the high 80's with humidity even higher. The NCL ship was gone, but there was a Silversea ship anchored off shore until around 10:00 PM when it sailed off. We watched a faux-pirate party ship return to the dock, then went back to the room to wait for the sail away at midnight. Since we have a verandah facing the pier we don't have to bother going out again. We received the Guest List today and by our rough count there are only about 550 paid passengers on board. Today's weather is hazy, very humid and hot. The sea is smooth and we're sailing very slowly. As usual, our first stop was for lunch. There is an "Asia Café" buffet around the Neptune Pool today, but it is way too hot up there for us to be bothered. Besides, we know that they carry the buffet theme over to the Dining Room, so why not be comfortable? Judging by the crowd in the Dining Room, many others found it too hot upstairs, also. There were plenty of open tables and we were seated at a table for two in the same location we usually sit on the Symphony. There is a high percentage of women servers on this ship, which is fine. They seem to be somewhat more attentive than the men. We both had the Spicy Orange Chicken that in this case meant salty rather than spicy. Otherwise it was OK. Didi and Walter both stopped to chat during lunch. With nothing left to do after lunch, we returned to the room to lounge around until time to slap ourselves together for the Crystal Society Party at 7:45 PM tonight in the Palm Court. We spent the day on the verandah, napping, or both. Our video tape was returned transferred from PAL to NTSC, but we have no way of verifying this since the TV's now use DVD players instead of VHS tapes. We finally found it necessary to complain about the air conditioning in our room. The temperature had risen to 77 by the time we left for dinner. We arrived precisely on time for the Crystal Society Party and again found no line for the Captain. However, there were a lot of people there, although it wasn't anywhere near capacity. We wandered all the way around through the Vista Lounge and ended up where we could see, but not be seen. Marco found us eventually and sat down to chat for the rest of the party, which was fine with us. The speeches were extremely short, so the party was over ahead of schedule. We invited Marco and Benji to join us for dinner on the last formal night, but we're awaiting a confirmation of that from Benji. We have a reservation for Kyoto tonight, but here is the Dining Room menu so you can decide which you would prefer. Food review: Everything was very good to outstanding, as expected. The appetizers were all outstanding, as was the Teriyaki Beef part of the Obon Tray. All of the other entrees were very good and beautifully presented on a delicately arranged tray of small dishes. Several guests have been overheard complaining about the menu in Kyoto, but we found nothing objectionable about it. There are enough choices to make more than one visit worthwhile, in our opinion. We chatted with Paulo several times during the meal. He said that there were only 15 reservations for Kyoto tonight and two of those had cancelled. We were the only two guests in the restaurant most of the time, so the service was even more attentive than usual. Our waitress, Analyn, was exceptionally gracious. Since we had 45 minutes to kill before the show we stopped by the room where we found a note from maintenance saying they had fixed the air conditioning. It was indeed a few degrees cooler, but it didn't get below 74 and slowly crept up all night. Of course, it is about 90 outside with 100% humidity, so it's better than nothing. Tonight's entertainment is the near-prehistoric production show "Irving Berlin, The Man and His Music". The last time we saw this show it was beyond boring and rife with production errors and technical glitches. Tonight the show was marginally better than the last time we saw it with no major technical problems. But, the performance was amateurish at best. Even with the best efforts this would be the worst show currently playing anywhere in the fleet. Sometimes there is a reason shows are dropped and this is a good example of why they shouldn't dredge up old productions to save money. Before the show, Ron came by to say the right things, as usual. He really does do a great job going around and mingling with the guests, far more so than other cruise directors. He asked if we are planning to come to the 15th anniversary voyage on the Harmony in June. Since we didn't know anything about it, we said we weren't. However, he insisted on having the Cruise Consultant send us information and carried on about all the people who will be there. We wouldn't mind an Alaska cruise again, so it is a realistic possibility that we would participate. Ron also said that NYK was so impressed with the condition of the ship that they are considering giving it another makeover rather than getting rid of her. We think that's a wise choice unless there are mechanical reasons for unloading her. It is supposed to be 96 in port tomorrow with very high humidity, so we are obviously not planning to go ashore. The seaside port of Zihuatanejo was established over 100 years ago. Today it maintains the rustic charm and easy-going ambiance of that period. Picturesque and unspoiled, its golden beaches and brilliant waters are somewhat reminiscent of Polynesia. Just five miles away lies its twin town, the burgeoning resort of Ixtapa, an isolated oasis of high-rise hotels. Zihuatanejo's natural beauty has been preserved and its pristine, fine-grained sandy beaches remain. However, there are some modern touches. Former dirt streets are now cobblestone and numerous chic boutiques and bars serving chilled cervezas have sprung up. It is 97 with humidity to match, so it's a good thing we weren't planning to go ashore today. It is a beautiful day to look at from inside the air conditioned ship though. We are anchored close to some beach resorts and fancy hillside homes. Our first stop was the Lido for lunch. They were serving a tasty carved beef brisket, among other things, from the buffet. Everything we had was very good, a vast improvement from the past. Hopefully they have finally caught on to a way to make their Lido food more consistent. Unfortunately, the service didn't match the food. The waiter who insisted on taking our tray to the table didn't offer to bring drinks. With the incoherent layout, that meant having to negotiate the serving lines to the far end of the room to get a beverage. However, the deck stewards did offer frequent refills, once we had glasses to refill. The waiters from Prego were on the surly side, certainly not the Filipinos from Kyoto or the Deck Stewards. The Wine Steward looked particularly unseemly, chewing gum and looking generally put out to be there. It quickly became too warm against the windows even though we weren't in the sun. We strolled across the open decks where it was hot, but not too bad in the shady areas. There were no guests out in the sun if that tells you anything. Everyone was in the shade, the few who dared be outside at all, that is. We kept walking right back to the room. Cetin was in the hallway preparing to go out for some garlic shrimp. He asserted that is the only food worth eating in Mexican ports. We spent the afternoon in the room watching TV and reading. Internet access has been sporadic at best, so we aren't able to update the site or retrieve emails as often as we would like. There was a message from the computer manager this morning saying that internet service wasn't available today, so we would be credited $30 on our account. She called back later to say it was available after all, but we weren't able to connect while we were in port. In our opinion, the internet access on this ship is nearly useless. It is so slow that it takes forever to do anything and it isn't working at all at least half the time. Speaking of things not working, the air conditioning seems have been dying a slow death today. It has become warmer as the day goes on. We couldn't get out of the room fast enough after dressing for dinner. The stewardesses in the hallway said that it is 78 in the crew areas, so we'll consider ourselves lucky that we're only up to 76 at the moment. By the way, we have a thermometer built into our travel clock, so we're not guessing about the room temperature. 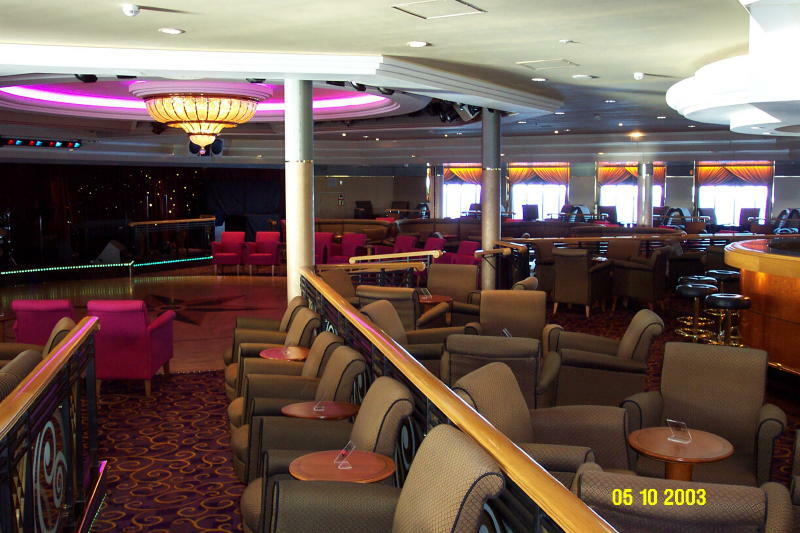 We went to the coolest place on the ship, the Vista Lounge, to wait for dinner time. Food review: Tonight's meal was one of those outstanding events that have become so rare on Crystal Symphony. Everything was exceptional and beautifully presented. Even the vegetables served with the entree were outstanding. We were discussing this fact with Walter, the Maitre d', when Zsuzsa brought our desserts and proved our point. The plates were decorated with two types of chocolate curls along with the fudge sauce. We'd guess that the Dining Room was less than 25% capacity tonight, if that. We have no idea where everyone could have gone, but they sure weren't in the Dining Room. We had some time to kill before the show, so we stopped by the room to turn off the lights in the hope that it might cool down a bit by the time we returned. It was 77 when we went up to do that. It was also hot enough in the Dining Room that waiters were using tablecloths to wipe their face. No, we're not kidding. Tonight's entertainment is "Musical Variety Artist" Mark Donoghue. Ron stopped, as usual, to ask if we have seen this act before, which we have. He also had some information about who will be on the next World Cruise, but that's only a curiosity for us since we have no intention of booking it. Mark's act was entertaining and he is quite talented, but there were less than 60 people in the audience and 10 of those left at various times during the show. In our opinion, if you choose to sit in the front row you should have the decency to stay for the whole thing. Obviously certain people do not share our viewpoint. By the way, there was no glaring reason to get up and leave. It was very cool, even cold, in the Galaxy Lounge, so at least we know where all of the air conditioning power is going tonight. By the time we had returned to the room it had cooled down a few degrees, but there is obviously a problem. We are sailing north again, so we move back on the clock one hour tonight. More of the usual today, very hot and humid with smooth sailing. It was overcast until around noon, but was clear the rest of the day. We had to complain about the poor air conditioning again this morning. Actually, this was prompted by Eriika who thought it was way too warm in the hallway, which it most certainly was. Although we were up and ready by 10:00 AM, we didn't go out until 11:30 AM. Even so, Eriika was worried that she had been too noisy in the corridor. We assured her that we hadn't even noticed anyone was out there, let alone too noisy. Our door is directly across from the linen closet and the guest laundry, but we rarely hear anything from outside the room. Today is the day for the Grand Gala Buffet in the lobby. We did go down to look at it from the level above, but had no intention of eating there. The layout is the same as the other ships. It does look nice, but the whole affair has been cut back significantly from it's lavish beginnings, in spite of claims to the contrary. We know cutbacks when we see them. We browsed the shops and chatted with Shelley. Eventually we found a Lalique item to buy, although we need absolutely nothing. The only reason we even look in the shops is to use up our shipboard spending credit. We also picked up our photo from the Crystal Society Party, another item we need like a hole in the head. For lunch we went up to the Lido where we encountered more guests than one would expect on Gala Buffet day. It was by no means crowded, but there were enough people there to make it look lived in. All of our lunch selections were tasty, especially the warm bread pudding for dessert. Although it sounds odd, the ham and cheese burritos were pretty good, as well. We chatted briefly with a World Cruiser who is on his 110th voyage. He tried to convince us, unsuccessfully, to book this year's World Cruise. He filled us in on a couple more of the World Cruisers who have died this year. It became too hot in the Lido to just sit there, so we went out by the pool, in the shade, to listen to the band for 30 minutes. It was bearable out there because the air was moving. There were enough people out so it didn't look abandoned, but there were plenty of chairs and tables to choose from. The deck stewards were reasonably attentive today, but not nearly as much so as they are on the other two ships. They are quite friendly once you get a chance to speak to them. We retreated to the room for the afternoon and kept the drapes closed to help manage the heat. By the way, it is much cooler in the room than it is outside, so it isn't as though the air conditioning isn't working at all. But it is too warm and humid to suit us. A maintenance man came by to pretend to do something about the air conditioning. He said the ocean water was too warm and it wasn't cooling the compressor enough, but we don't buy that excuse. Some parts of the ship are freezing, so that can't be the reason. He opened some dampers in our ceiling vents to get the air to move more, but it did nothing for the temperature. We have an invitation to the Captain's Quarters Cocktail Party tonight before dinner. We were among the first to arrive for the party where Andrew was manning the guest book. The Captain stood at the door doing basically nothing, which he continued to do throughout the party. We really don't care what he does, but everyone was waiting for some sort of speech that never took place. The topic of conversation was the lack of air conditioning on Penthouse Deck. It was also very warm in the Captain's Quarters and everyone was dripping. We had to stop by the room and blow dry our shirts before going down to dinner. Thank God it was a casual night. Tonight's dress code is Casual/50's for the 50's Dinner. As far as we know, this is the only ship that still has this theme night, although we think maybe it is still held on the Symphony. Food review: As you can see we had almost everything on the menu. Well, not quite, but we did have a lot of food tonight. The fruit was topped with chopped bits of something, but we have no idea what. It wasn't a wise choice whatever it was. Both soups were satisfactory, but nothing special, although the corn soup was better than it was last time on this ship (anything would be better, by the way). The prime rib was also acceptable, but not great. Bill didn't want the corn on the cob that comes with it (a wise choice), so he tried to substitute the sides from another entree. Zsuzsa thought he meant sauce and all, so she was taken aback that he would want a fish sauce on beef. Once that was straightened out everything was fine. For the first time ever, we got a real banana split with three kinds of ice cream. Bill also had the brownie just to try it. Both desserts were fine and we were stuffed. We finally got a real explanation of what's wrong with the air conditioning. One of the compressors is broken down, so some parts of the ship have cooling and others don't. The Dining Room doesn't, which isn't a good thing for us or the staff. At least someone had the guts to tell us that there really is a problem rather than trying to pretend we are the only ones complaining. We had more of a conversation with Zsuzsa than we ever have. She is always pleasant, but not particularly forthcoming. Tonight she had a bit more to say than usual, which was nice. The evening entertainment is the production show, "Rock Around the Clock". This very tired, but popular show has been around forever. Saying this show is tired is an understatement. This is the worst production we have ever seen of it. There were some technical problems with the microphones, but mostly it was the performance itself that was poor. They can ditch this old dog anytime now. There is a 50's themed buffet afterward featuring hot dogs, hamburgers, shakes, and popcorn, among other things. It was scaled down to fit in the Bistro, so it didn't spill out into the lobby as it has in the past. Paulo tried to make us come over for shakes, but we were still full from dinner. This theme buffet is always well attended. A reliable source told us that the air conditioning broke down because they hadn't used it enough in Alaska and the water intake had filled with cold water clams. When the ship moved into warmer waters, they died and got sucked into the compressor, which then clogged and stopped working. Supposedly it has now been fixed and it is a matter of time before the fluids start pumping normally. We'll believe that when it happens because it was still 78 in the room when we got back. However, we do believe the reason that it broke down. It continues to be smooth sailing at a barely discernable speed tonight. There was no internet service available all day today. Once again we have no internet service and have been credited $30 for the day. Whatever they did to fix the air conditioning hasn't worked. It is still too hot in most areas of the ship. It is about 95 outside, clear and very humid. Nothing has changed within view of the ship, so there are no new photos to share. As usual, we have no intention of going ashore today. Although we were up early enough for breakfast, we didn't venture out until 11:30 AM when we went up to sit in the shade by the pool. On the way, we strolled past the dining room to check the lunch menu, to no avail. At noon we moved into the sparsely populated Lido for lunch. This wasn't the best selection of food, but what we did have was edible. We watched an old couple move around semi-arguing about which table would be in the coolest location. Face it, none of the tables are cool when the air conditioning isn't working properly. At least someone had the foresight to close the wood blinds today. When we returned to the room, we found that the stewardess had kept the drapes closed, so it is obvious they are aware that the problem isn't solved. We don't mind staying in the room all day when we can see out, but it's kind of pathetic to stay in with the drapes shut and the lights off. There were enough old ladies who did that for an entire World Cruise! We decided it was cool enough to open the drapes for a while. We'll see how it goes for the rest of the day. There was a brief electrical surge that caused the TV to turn off and all of the programs that were running to be reset to the beginning. Otherwise, everything stayed the same all day. Cetin was thrilled when we asked him to bring some fresh mixed nuts after we refused the foie gras platter. He chatted for quite a while about where he lives in Turkey, etc. Mostly it was about life in general, which was interesting. We managed to drag ourselves outside for the sailing at 7:00 PM. This was accompanied by some elaborate electrical storms over both the local mountains and the ocean in the distance. The light show continued for several hours, but it was always in the distance and had no affect on the ship. We're again lucky that tonight's dress code is Casual. On the way out of the room to dinner, Eriika inquired whether they had fixed our air conditioning. We informed her that it was slightly better, but not repaired. She wanted to report it again, but since we know it is a bigger problem than just our room, we didn't see much point in it. Food review: The appetizers were about average except for the shrimp rolls that were a bit better. The pasta was satisfactory, but not quite what we expected. The fish entree was excellent and nicely presented. Didi wanted to attempt the Uruguay dessert with fresh peaches and caramelized sugar, so we let him try it. The people at the next table were interested in it also, but then again, they are pretty much interested in everything that happens at our table. In any event, Didi prepared the dessert exactly as we instructed him to and it came out perfectly the first time. He doesn't insist on adding "fancy" embellishments to things, so he was able to recreate the dish just as we like it. Kudos to Didi! The evening entertainment is a variety show featuring Dance Champions, Kevin and Diane Clapson, and "Love and Laughter, Italian Style" starring Richard Ianni. Honestly, the only reason we went to this show was that we knew it would be cool in the Galaxy Lounge. The dance couple performed for ten minutes, if that. They were technically very good, but lacked a certain spark that some of the previous duos have had. We were fairly certain we had seen the comedian's act before and we were correct. It was word for word the same act we saw two years ago on a World Cruise. There were only 50 people in the audience (we counted) when the show started and about ten of them left at various points. Richard's act was a bit tedious, but it was acceptable. We received our disembarkation information and a confirmation from the concierge for our private transfers from the ship. We hadn't thought of this, but with the private arrangements we don't have to meet in the lounge with everyone else. We report to the Crystal Cove to be personally escorted to our transportation. Not bad, especially since this is a free benefit of our 30th Milestone. Our departure time is 10:30 AM, but we have to be ready for Customs inspection by 7:30 AM. Last time they told us at this point about the early Customs inspection only to retract it because the inspection was done in the terminal. All we can hope for is that the same thing happens this time, too. It became slightly rocky after the show. As far as we can tell it is due to the wind and not rough seas. This isn't to say it is rough at all, but there is some discernable movement from side to side. It was still around 90 at dusk with humidity to match. The weather today is hot, but not humid, so much more pleasant. It appears that air conditioning has returned at last, but it could also be that it isn't as hot outside. Whatever, it's an improvement. We wandered out a bit too early for lunch and found Erika in the hallway. We chatted with her a bit about nothing in particular, then went down to get an extra Customs Declaration from the Front Desk. From there we went up to sit by the pool and await lunch time. The sky is clear and there were lots of people out on the water on jet skis and small boats. As usual, the ship is being guarded by small Mexican military boats. We're not sure what these tiny boats could do about a real threat, but at least they are watching. We decided to go to lunch in the Dining Room today, which was a good choice. We both had the French Dip sandwich. Everything we ordered was outstanding. Although we sat at our regular table, we were served by a waiter we didn't know. Around 1:00 PM, the scheduled sailing time, there was an announcement searching for three missing guests. Ultimately, we departed about 45 minutes late. 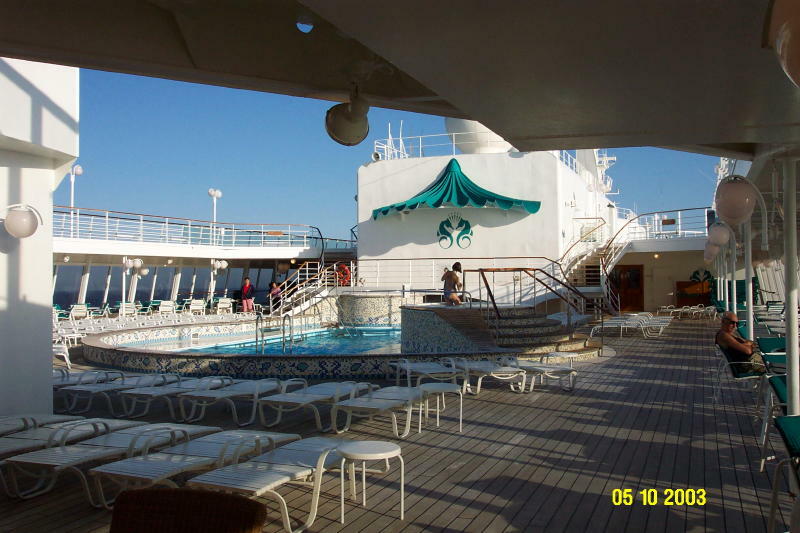 By that time we had moved back up to the pool deck where we could see the scenery as we sailed out of the harbor. Once we were out to sea, we went down to talk to Andrew and have him change our address with Crystal Society. We chatted with him about some of the higher-up Crystal Society members, among other things. There seem to be some changes in the wind for the Crystal Society Reward Program, but nothing was forthcoming today. Apparently it has gotten a bit out of control and something needs to be done to reign it in. We have thought that for a long time. Andrew was interested in what we had to say about what we would like to see in the future. We would prefer discounts on fares over anything else. We just don't need thousands of dollars in shipboard credits since we already own anything we could possibly want from the shops. The rest of the afternoon was spent in the room watching TV. At least we can open the drapes today and not fry. Tonight's dress code is Formal for the Captain's Farewell Cocktail Party before dinner. The Captain made an official announcement that the air conditioning has indeed been broken down for several days. It's about time someone owned up to it rather than handing out lame excuses. He said that they "had removed buckets and buckets of clams, barnacles and slime" from the pipes to get it working again. "You should have seen it! ", he declared. As usual, we hid out alone in the Vista Lounge until it was time to meet for dinner at 8:45 PM. Food review: Everything was very good to outstanding and beautifully presented. The restaurant was full, but all of the patrons were officers and staff, except for us. We enjoyed our conversation with Benji and Marco. They like a lot of the same things we do, so it was fun sharing about various aspects of our lives in general. Both of them are down to earth, likeable people, which makes for a pleasant evening. The evening entertainment is Crystal's newest production show, "Curtain Call". We only saw the last half of the show and it was fine. It's not nearly as awe-inspiring as they would lead us to believe, but it's a good show. Apparently, the cast rehearses this show more than the others because their performance was more precise tonight. There isn't any scenery to speak of, it is mostly elaborate costuming that sets the stage. As promised, the air conditioning is indeed functioning again. It is quite windy out, so the ship is rocking a bit, but not anything near being rough. Today's weather is foggy and in the low 70's. The ride is the same as it has been, relatively smooth. Since we were awake earlier than usual, we ventured down to the Bistro for a breakfast snack to tide us over until lunchtime. After snacking on some tasty fruit and pastries, we wandered down to the lobby and found Marco alone at the Shore Excursions Desk. We chatted with him for a few minutes until it was time for him to take a break and for us to check out the Dining Room menu for lunch. There is an American Classic Buffet around the Neptune Pool for lunch today, but we've never been a fan of Austrianized American food. We opted for the Crystal Dining Room. Our lunch choice, the Monte Cristo Sandwich, was dry enough to choke a horse, but it tasted OK. Otherwise, lunch was uneventful. We decided to go out on deck and listen to the band for a while. Just seconds before we emerged onto the deck, the pool had decided to catapult water all over everything. 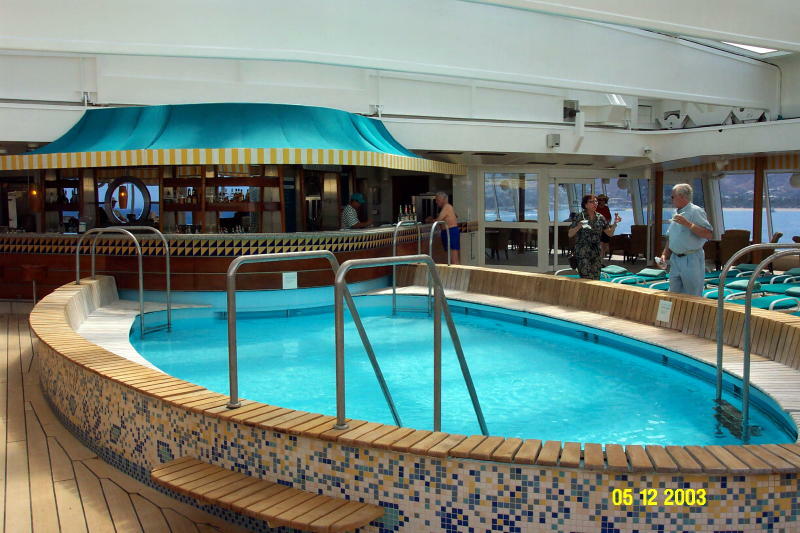 The movement of the ship is barely discernable, so this is sure a wimpy pool for keeping the water contained. We amused ourselves by watching the water gain momentum and slosh out time after time while a deck hand ran around valiantly trying to squeegee the deck. So much water came out at one point that the wooden drainage grates along the edge of the deck floated up. It was rather chilly outside, so we decided to go back to the room. On the way we passed by the salon to say our goodbyes to Benji. Even before lunch, our stewardess had put our suitcases on the bed ready to be packed. It's a nice gesture, but it forces us to pack earlier in the day than we would like just so we can clear off the bed. Tonight's dress code is Casual. The evening entertainment is being presented before dinner. It is a Variety Show featuring Richard Ianni, Mark Donoghue, Dale Kristien, and the Crystal Ensemble. The Crystal Ensemble part is pretty to look at, but that's about all we can say for it. They leave the stage and line the doors as the guests exit. We're not sure if this is to be friendly or so that we will notice the beaded gowns they are wearing. Otherwise, the show consisted of one or two numbers by each of the above mentioned entertainers, which was actually quite enjoyable. We'd much prefer to watch a few minutes of several people than an hour of someone we're not thrilled with. Anyone should be able to carry a five-minute set. Food review: There was nothing exciting about anything we ordered tonight, but everything was very good. The chicken soup would have been better without the slimy sun-dried tomato bits that were sunken to the bottom of the bowl. Bill pigged out and ordered a second serving of the sweet and sour pork. It wasn't outstanding, but it was good. The macaroon tart had nothing at all to do with macaroons that we could discern, but it was pretty to look at and was light and tasty. Didi gave us his contact information off the ship. We had given him ours earlier. He was busy elsewhere for most of the evening, so we didn't get to talk to him again. Zsuzsa acted as though she was happy to have served us. The dining room was less than one-third full from our perspective. We still can't figure out where everyone goes since the alternative restaurants are fairly small. Maybe with only 300 guests total per seating it makes a bigger impact? We received a revision to the disembarkation information for tomorrow morning, as always. The ship is arriving 30 minutes later than expected, so we don't have to report for "inspection" by Customs until 7:00 AM rather than 6:40 AM. Exciting, huh? Something else new for disembarkation is that guests with independent travel arrangements from the ship may disembark anytime between 8:30 AM and 10:20 AM, "Whenever you are ready." Makes sense, but this is the first time we have ever seen it done that way. 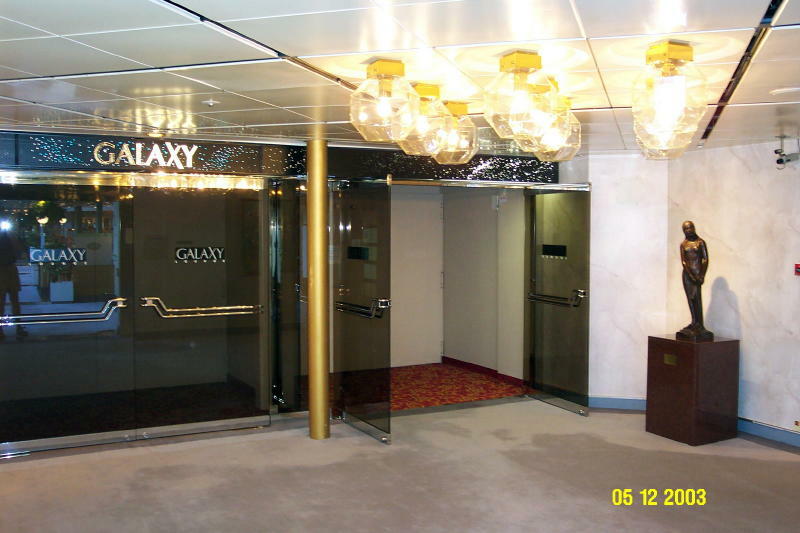 As in the past, there is no requirement to vacate your stateroom until it is time for you to meet in the Galaxy Lounge for disembarkation. By the way, since we have private arrangements through the concierge (due to the 30th Milestone), we even bypass that part and go directly to the lobby at 10:15 AM. It was slightly rocky all day after the pool water started sloshing out this afternoon. It was also cold and looking a bit stormy outside, although it didn't rain that we know of. Today's arrival was very slow due to the extremely foggy conditions. The ship had to park outside the breakwater, surrounded by five Coast Guard vessels, to wait for a break. Each time the fog would lift slightly, we would move ahead, then stop again. All of this resulted in a one-hour delay for docking. Of course, this threw everything off, so we could have slept in another hour or more...had we known. Since we were up anyway, we went to the Lido for our first and only breakfast on board. It was crowded, but not ridiculous. All of the food we selected was very good, except the waffles that were doughy. The waiter seated us all the way around the other side in the Kyoto Restaurant section. We killed enough time sitting around to make what should have been the rescheduled hour to arrive for Customs inspection, 8:00 AM. No such luck. An announcement was made that anyone who didn't have a pressing need to get off the ship immediately should wait until 8:30 AM. Fine with us. Later another announcement asked that no one else go down for inspection for at least 20 minutes. This was at 8:30 AM. So, we waited until 9:00 before wandering down. The line was back to the elevator lobby, but it moved along very quickly and wasn't more than a 10-minute wait. The officers asked more questions than usual, but they were still pointless. Anyone could make up respectable answers for what they asked. Dave responded that he lived in Bonsall, although his form said Laguna Niguel. The officer was more interested in where Bonsall is than the fact that this answer didn't match the paperwork. We still had over an hour to wait for our time to meet downstairs, so we returned to the room. There we found maintenance men on the verandah painting over the rust with a foamy liquid they said was to prevent rust. As far as we can tell, it doesn't work very well, but that could have something to do with the fact that someone came right behind and washed everything down with water. After getting bored sitting in the room, we decided to take a walk around the decks. Cetin was in the hallway and in a chatty mood, so we stopped to talk to him for a few minutes before heading up to the Sun Deck. The fog had thinned a bit by now and the disembarkation procedures were underway. A few announcements were made asking independent travelers to please not disembark yet because there was too much of a crowd in the terminal. It was around 10:00 AM by now and we decided it would be more interesting to go down and sit in the Crystal Cove to wait for our departure. There were a few other guests sitting around waiting for transportation, but the concierge came over in just a few minutes to take us out to the car. Getting off the ship was fairly amusing because there was a throng of people clogging the exit waiting to disembark. The people who had been seated next to us in the Dining Room were standing there and acknowledged us as we passed. The Concierge led us through the crowd and directly off the ship. These people already wonder who we are because we know the staff so well, so this must have really perplexed them. Of course, anyone who books onward transportation while on board gets the same VIP treatment, but they don't know that. Crystal handles disembarkation very efficiently to avoid any crowds waiting in the terminal or outside. There are representatives stationed every few feet lest anyone get lost on the way out. The Concierge accompanied us, found our luggage, retrieved a porter, and walked us out to the waiting limousine. We ran across Marco in the luggage area and chatted with him for a second before heading out. We were back in Laguna Niguel exactly one hour from walking off the ship. It dawned on us on the way home that in the future it would be a good idea to wait and book transportation back home while on board. This way we could use our shipboard credit to pay for it. At the end of this cruise, we had $160.00 in credit that was forfeited. Crystal provided today's transportation because of the 30th Milestone, but booking on board would be a good thing to keep in mind for the future. Plus, we get the personalized service during disembarkation. 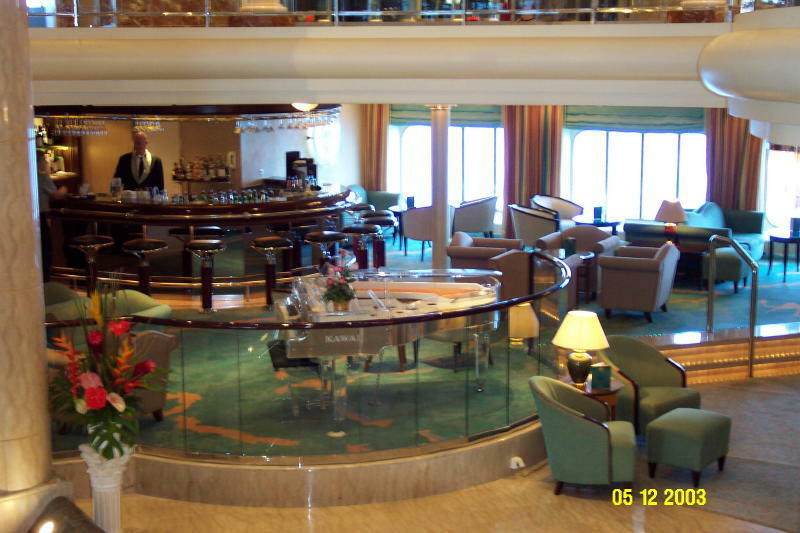 We would rank this cruise experience among the top of all of those we have taken, ports aside. 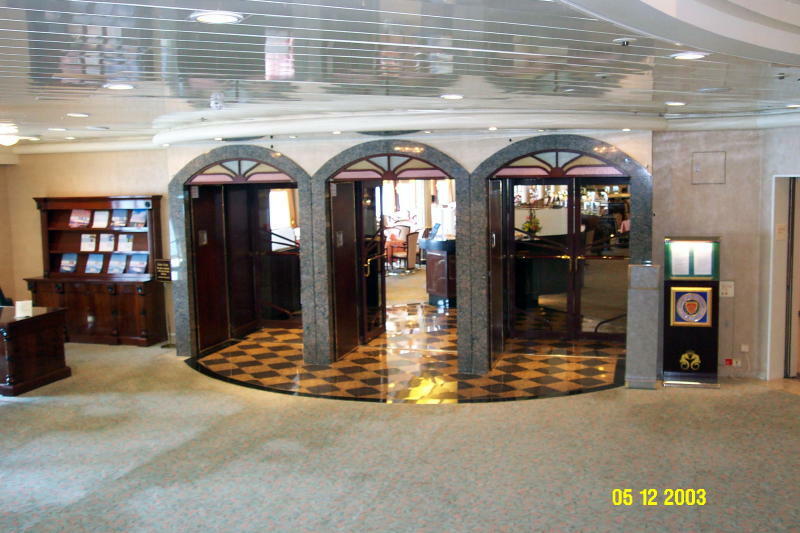 Although Crystal Harmony is older, she has been extensively renovated and is in pristine condition. Any remaining quirks are overcome by the relaxed atmosphere in comparison to her newer sisters. It's difficult to put a finger on the exact reason, but we do think this ship is a less stuffy attitude than the other two. 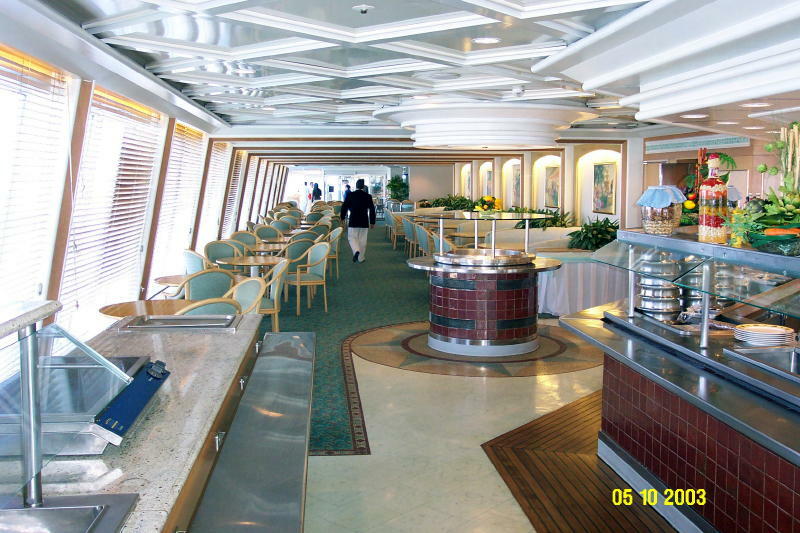 Food on Crystal Harmony is far superior to that on either Symphony or Serenity, although the menus are identical. It all comes down to presentation and preparation, something that is much better here. The officers in charge will swear up and down that there is no difference among the ships in that regard, but tasting is believing. This is another reason this ship has bumped up a few notches in our book. On the other ships we're always somewhat disappointed in the food. At almost every meal, either the vegetables are skimpy, potatoes dry, or the soup is too salty. There was little of that here. On the downside, the waiters in Prego are a bit surly. When they are actually serving you in Prego, they are fine, but outside of that they act as though they'd rather kill you than serve you. Our impression, right or wrong, is that they are entirely motivated by the possibility of receiving a tip. 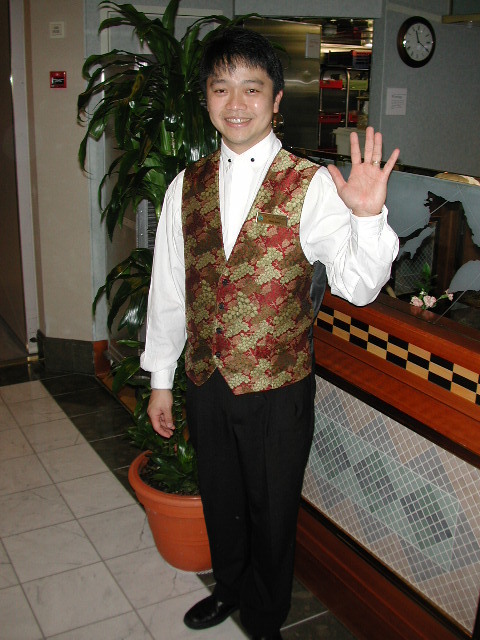 The waiters from Kyoto are Filipino and are extremely friendly and accommodating, however. We found the Deck Stewards to be equally as personable as those on the other ships, but their service isn't nearly as attentive. Last cruise we attributed that to the capacity crowd, but it was exactly the same with this less than full ship. We don't really care, but it is a notable difference. By far the worst service offered onboard is the internet connection from the staterooms. We would never again buy the one-price "unlimited" usage package on this ship. The connections were so slow it took forever to do anything, but that was assuming we could even get a connection at all. We ended up being credited $90.00 without asking for it. The package for ten days costs $300.00. We were told that Crystal plans to replace all of the Penthouse bathrooms with new, marble versions at the next dry dock. We really didn't find anything objectionable about them and they were in perfect condition. However, we suppose that they don't live up to the definition of "luxury" unless there is marble, marble everywhere. We'd like to see the bidet eliminated and replaced with more storage space. The penthouses in general are extremely creaky no matter how fast or slow the ship is moving. This doesn't bother us at all, but it's something to consider for a light sleeper. We could hear a bit of noise from adjacent cabins, but nothing at all from the corridor. We were directly across from the linen closet and the guest laundry, but we never heard anything objectionable. As an aside, there were two small children on board, a toddler and a child about 6 years old. We saw the older child only twice the entire time. She was able to entertain herself in the small children's playroom. The toddler was always screaming or running around, but did not affect us. Whatever Crystal's assertions to the contrary, these are not ships suitable for children. The other passengers do not think the children are cute and they do not belong here, period. There are plenty of suitable cruise lines for families and children, but this is definitely not one of them. As we said, all in all, this was a very positive experience that we plan to repeat as soon as possible. 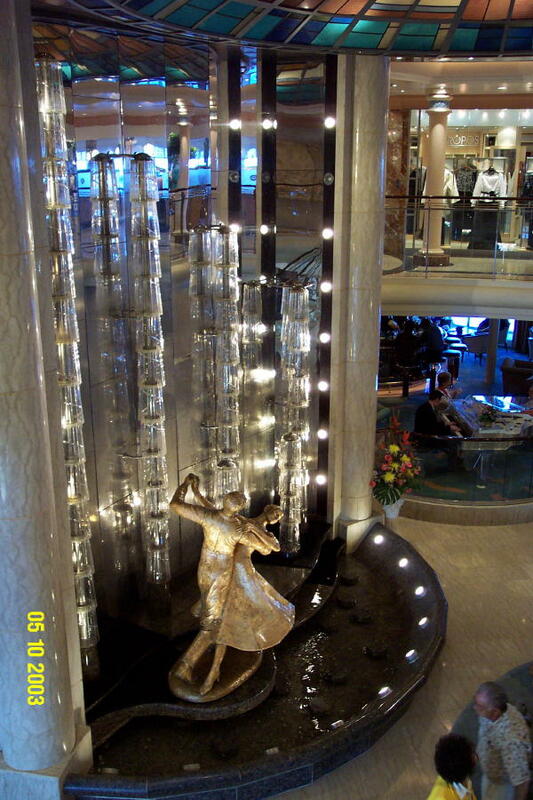 Our next voyage is scheduled for Crystal Serenity in January, 2005. We decided to downgrade our booking from a penthouse to a verandah cabin. Quite simply, we don't feel that the higher price for Crystal Serenity is worth it. Why pay more just because the ship is new? Crystal Harmony is well up to snuff and costs a heck of a lot less.